Well, I have five Treeing Walker Coonhounds (and three cats- all rescues), so you can imagine how much dog poop I have to deal with. I always pick up after my dogs if they mess while we are out walking, but I worry about the fact that most plastic poop bags aren't environmentally friendly. I'm also a volunteer rescue transport driver, and we give the dogs a chance to potty when we are at hand-off spots. Again, I make sure to pick up any poop the dogs do there. 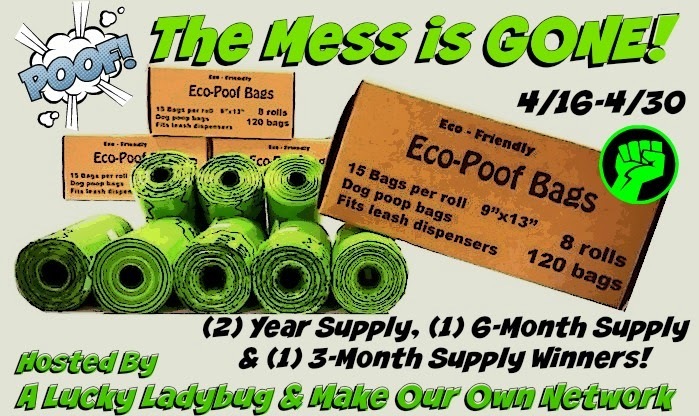 I can never have too many poop bags! We live on a short street with a park and walking path behind our home. There are numerous dog walkers passing through our yard daily and I would use these to clean up our yard and the neighbors yards. We lost our sweet dog recently but frequently dog sit for our kids and these would come in handy.